Queenstown Scenic Cruises offer memorable trips across the placid waters of Lake Wakatipu and, further north, Milford Sound. With spectacular mountain backdrops, and heaps of history, cruises here are so much more than just sitting on a boat. 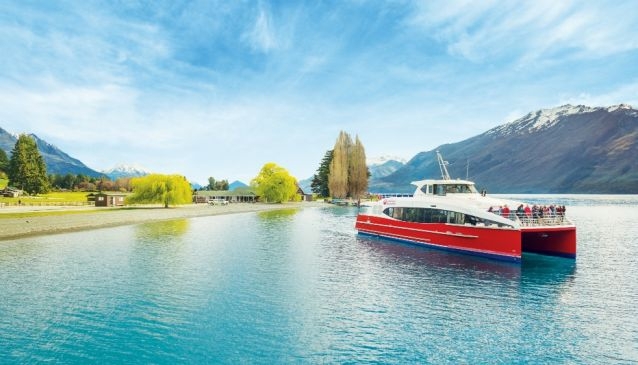 Scenic Cruises in Queenstown are special for a number of reasons. With the stunning Lake Wakatipu right there, and Milford Sound, just 'up the road', this area is made for exploring. With Te Anau, Queenstown is the main hub for those wishing to explore Milford Sound. You can make your own way up there, or join a coach/flight trip. Once there, companies like Southern Discoveries, JUCY Cruize and Mitre Peak Cruises will show you all the jewels such as Stirling Falls and Mitre Peak itself. If you want to stay closer to base, there are numerous cruises across Lake Wakatipu. The TSS Earnslaw steamer ship is the most popular vessel, which crosses from Queenstown to Walter Peak. Alternatives include Southern Discoveries' state-of-the-art Spirit of Queenstown catamaran, or Million Dollar Cruises, which has two funky boats to hand.